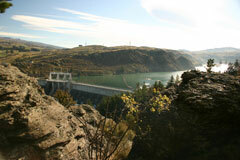 Lake Roxburgh Village offers an insight into the building of one of the country’s important hydro dams. It is also a recreational gem and a stepping off point for exploring Lake Roxburgh. The village lies in the Teviot Valley at the base of the Roxburgh Dam wall alongside the Clutha River. It is a 20-minute drive from Alexandra and 10 minutes from Roxburgh. Lake Roxburgh Village was the permanent residence for dam maintenance workers. Houses, service buildings and huts are still there and remains of the main Roxburgh hydro construction village can be seen on the east side of the river at The Lost Village site. The dam was commissioned in 1956, but many workers never saw it completed, having left when their jobs were done. A reunion in 1991 gave many a chance to see the wall and the recreational paradise it had created. Explore majestic Lake Roxburgh – Doctor’s Point gold workings and races; dams at Shanty Creek and Herrons Cottage at the mouth of Gorge Creek. The lake is accessible by car only from Roxburgh via Knobby’s Road on the east side of the river, which takes you to McKenzies Beach, a popular picnic spot. Lake Roxburgh Village is the ideal access place for water sports and the lake is well stocked with both brown and rainbow trout. It also has quality Central Otago accommodation and dining. Of the Central Otago cycle trails and historical walks, a definite must is the Commissioners Walk starting across the dam from the village. It encompasses the extensive 20 metre schist bridge buttress, rock shelter remains, dam lookouts and construction interpretation. A picnic at the local playground alongside overshadowing rocks, poplars, pear trees and the original town hall provides a chance to reflect on this nationally significant, once bustling development that is Lake Roxburgh Village.